Elounda is not only one of the most well known tourist resorts, in Crete and the Mediterranean as a whole, but it also boasts the most Super Lux Hotels than any other Greek tourist destination. The excellent landscape combined with the unique climate, the blue sea with the unique beaches, the numerous archaeological sites of all periods (Minoan and Byzantine eras, Venetian fort of Spinalonga, unique places of Worship-Monasteries) in an almost a walk distance, make an excellent general environment for unique holidays. 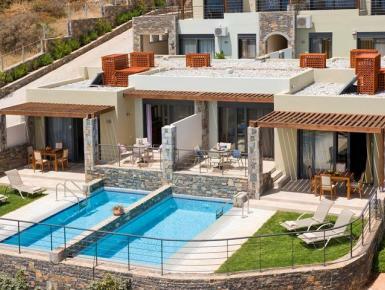 In this blessed land, in the area of the Luxurious Hotels, is also located this complex of Villas and Apartments. An environmentally friendly complex which features all modern amenities for unforgettable holidays. It has been adapted to stand without challenges and excesses.